The demand in the global market for constipation treatment is projected to increment at a healthy CAGR of 7.1% during the forecast period of 2017 to 2025. This prosperity of the constipation treatment market is primarily a reflection of escalating geriatric population across the globe, as people aged over 50 years are highly prone to irregular bowel movement. Consistent research and development to develop novel drugs that are more efficient, improving healthcare infrastructure in various emerging economies, and growing awareness among the end-users are some of the other factors favoring the global constipation treatment market. On the other hand, continued reliance of the patients on over-the-counter drugs and vast unmet demands in rural areas of developing countries is hindering the proper prosperity of the global constipation treatment market. 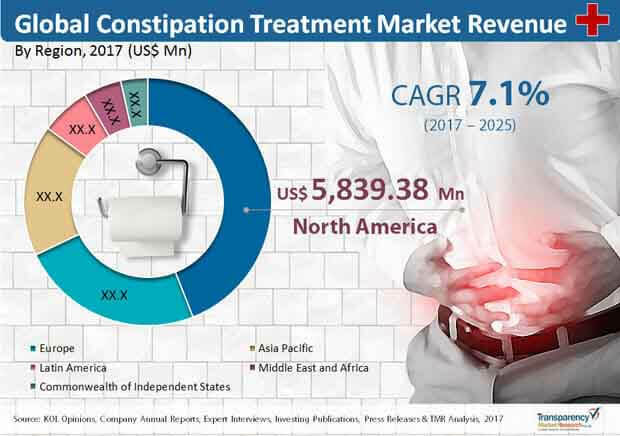 Evaluated to have a worth of US$12.58 bn in 2016, the global constipation treatment market is estimated to reach a valuation of US$22.93 bn by the end of the forecast period, which is 2025. On the basis of therapeutic option, the global market for constipation treatment is segmented into laxatives, peripherally acting mu opioid receptor antagonists, chloride channel activators, GC-C agonists, and 5-HT4 receptor agonists. In 2016, the laxatives segment, which is further categorized into bulk forming agents, stimulant laxatives, and osmotic laxatives, accounted for the maximum demand-share. Over the course of the forecast period, the laxatives segment is anticipated to be most promising and dominate the market share. Affordability for the masses owing to low cost and wide availability are two key factors leading to the prosperity of this laxatives segment. That being said, GC-C agonists segment is projected for the best CAGR of 8.7% from 2017 to 2025. Based on the type of disease, the global constipation treatment market is bifurcated into irritable bowel syndrome with constipation, chronic idiopathic constipation, and opioid induced constipation. The opioid induced constipation segment is projected to expand at CAGR of 7.5% during the forecast period from 2017 to 2025. Based on distribution channel, global market is classified into hospital pharmacies, retail pharmacies, and online pharmacies. Retail pharmacies segment is projected to hold major share of global constipation treatment market in the near future. Geographically, the global constipation treatment market has been classified into six major regions, viz. North America, Asia Pacific, Europe, Latin America, The Middle East & Africa, and Commonwealth of Independent States. In 2017, North America served the maximum demand in the constipation treatment market, owing to high prevalence of chronic constipation, high per capita healthcare expenditure, and availability of specialty constipation medicines. The North America constipation market is estimated to be worth US$9.98 bn by the end of 2025. Europe currently is second most lucrative region for the vendors operating in this market, however, Asia Pacific is anticipated to turn into a region-of-focus, with its considerably established market in emerging economies. Japan, India, and China are identified as three emerging country-wide markets for constipation treatment. Some of the key players currently holding a position of strength in the global constipation market are: Bayer AG, Ironwood Pharmaceuticals, Inc., Takeda Pharmaceuticals Company Limited, Sanofi, AstraZeneca, Abbott Laboratories, Sucampo Pharmaceuticals, Inc., Synergy Pharmaceuticals, Inc., Valeant Pharmaceuticals International, Inc., Valeant Pharmaceuticals International, Inc., Janssen Pharmaceutical Company, Daewoong Pharmaceuticals Co. Ltd., Prestige Brands Holdings, Inc., Shionogi & Co., Ltd., Renexxion, LLC., Albireo Pharma, Inc., and Cosmo Pharmaceuticals NV. This report on the global constipation treatment market analyzes the current and future prospects of the market. The report comprises an elaborate executive summary, including a market snapshot that provides overall information of various segments and sub-segments. The research is a combination of primary and secondary research. Primary research formed the bulk of our research efforts along with information collected from telephonic interviews and interactions via e-mails. Secondary research involved study of company websites, annual reports, press releases, stock analysis presentations, and various international and national databases. The report provides market size in terms of US$ Mn for each segment and sub-segment for the period from 2017 to 2025, considering the macro and micro environmental factors. Growth rates for each segment within the global constipation treatment market have been determined after a thorough analysis of past trends, demographics, future trends, technological developments, and regulatory requirements. A detailed qualitative analysis of factors responsible for driving and restraining market growth and future opportunities has been provided in the market overview section. This section of the report also includes market attractiveness analysis that provides a thorough analysis of the overall competitive scenario in the global constipation treatment market. Market revenue in terms of US$ Mn for the period between 2015 and 2025 along with the compound annual growth rate (CAGR %) from 2017 to 2025 are provided for all the segments, considering 2016 as the base year and 2015 as historic year. Market size estimations involved in-depth study of product features of different types of therapeutic options and various pipeline products. Additionally, market related factors such as preference for self-medication, regional availability of specialty drugs, projected launch of new drugs etc. in various geographies and historical year-on-year growth have been taken into consideration while estimating the market size. Constipation is common disease which is estimated to affect each individual once in life time. According to international as well regional guidelines it is characterized by frequency and nature of bowel movement. Less than 2 bowel movements per week, associated with hard stool and strain in passing is termed as constipation. Constipation may be occasional which lasts for few weeks or may be chronic which lasts for longer period and is recurrent. It may be associated with other conditions such as irritable bowel syndrome or opioid consumption. Based on therapeutic option, the global constipation treatment market has been segmented into laxatives, chloride channel activators, peripherally acting mu opioid receptor antagonists, GC-C agonists and 5-HT4 receptor agonists. The laxatives segment is further classified into bulk forming agents, osmotic laxatives, stimulant laxatives, and others. The laxatives segment is anticipated to hold a dominating share of the global market. The GC-C agonists segment is projected to have exponential growth during the forecast period due to efficacy and launch of new products. Based on disease type, the global constipation treatment market is segmented into chronic idiopathic constipation (CIC), irritable bowel syndrome with constipation (IBS-C) and opioid induced constipation (OIC). High prevalence of chronic constipation is estimated to contribute for dominating share of CIC segment in global market while increasing opioid consumption is projected to propel for exponential growth of OIC segment during forecast period. Based on the distribution channel, the global constipation treatment market is segmented into hospital pharmacies, retail pharmacies and online pharmacies. Ever increasing number of retail pharmacies, self-medication with widely available OTC laxatives is attributed for the significant share of the segment in the global market. Geographically, the global constipation treatment market has been segmented into six regions: North America, Europe, Asia Pacific, Latin America, Middle East & Africa and Commonwealth of Independent States. In addition, the regions have been further segmented by major countries from each region. The report also profiles major players in the constipation treatment market based on various attributes such as company overview, financial overview, SWOT analysis, key business strategies, product portfolio, and recent developments. Key companies profiled in the report include Ironwood Pharmaceuticals, Inc., Sucampo Pharmaceuticals, Inc., Synergy Pharmaceuticals, Inc., Takeda Pharmaceuticals Company Limited, Valeant Pharmaceuticals International, Inc., Abbott Laboratories, AstraZeneca, Valeant Pharmaceuticals International, Inc., Cosmo Pharmaceuticals NV, Sanofi, Daewoong Pharmaceuticals Co. Ltd., Bayer AG, Prestige Brands Holdings, Inc., Janssen Pharmaceutical Company, Shionogi & Co., Ltd., Albireo Pharma, Inc., and Renexxion, LLC.